Well it was lovely and sunny with very little breeze when I left Sheffield at 12.30pm for a session back to the same creek that I fished a couple of days ago. Once there the cloud had moved in and there was a stiff breeze blowing making it quite cool. The water level had dropped by some 5-6 inches too, but it's temperature hadn't. It was icy cold, same as two days ago. Today I'm testing a couple of new hard body lures for a small tackle company. 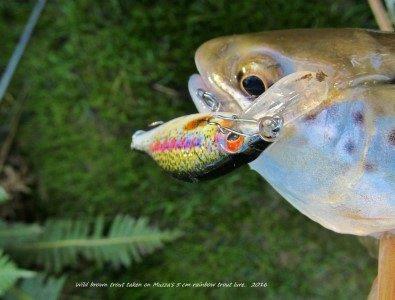 These are a small 5 cm floating hard body lure in a rainbow & a brown trout pattern. 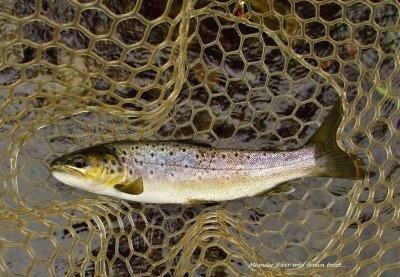 At last a day without wind or rain had me heading off with the trout rod to check out a couple of rivers to fish. Well the two that I was hoping to have a session in were both running too high for my liking so I went to a small creek some 20 kilometers away that I often have a fish in early season. Today I'm hoping it will give up a fish or two today as well. Once there I found it was running reasonably high and very cloudy in colour, but still fish-able. Before I put the waders & boots on I thought I would just flick a WildBait hard body lure from the banks of the creek. It only took a couple of casts before I had a hit and miss, so the signs were there that there may be a few fish about. I fished along the creek for just on fifty meters for three nice browns all in the 300gm - 500gm range. So it was back to the car and on with the wading gear. As winters chill hits and it’s time for a break from fly fishing for trout, it’s good to go over what occurred during the season and what stood out, what flies produced good results what days were red letter days and why. Usually there is no single cause and a great day is really a combination of reading the conditions, reacting to what is happening at the appropriate time and using the right flies and styles of fishing to make the most of opportunities that present their selves. The little pistol grip fishing rod complete with its Abumatic closed face spinning reel rests neatly in the crook of a forked stick that has been pushed into muddy ground slowly being inundated by the rising river waters. Soon the rod tip gives a slight bounce, a pause and then a more urgent bounce was noticed. The loop of line near the reel is pulled out from under the stick and soon line is peeling out through the guides. This action on the rod and line quickly brings the teenage angler to attention. He knows that another fat Mersey River brown trout has succumbed to his earthworm bait that had been cast into the flooded river backwater only minutes earlier. Given plenty of time to completely swallow the worm the trout is then hooked, quickly played and then unceremoniously dragged from the water. This trout is quickly despatched and then added to the string of others hanging from a nearby willow tree branch. Winter can seem to drag on as mayfly hatches and beetle falls become a distant memory. I hate sitting around and waiting and although we are still able to fish some waters during the cold, dark months, ‘opening day’ holds a special place in all fisherman’s hearts and minds. The usual decisions on where to go and what to use will no doubt demand deep thought but it is the preparation for the coming season that can influence your success for the ensuing months. Here's my 2015/16 trout season report & stats.... This was the third best season that I've had since moving to Tasmania.. It was a pretty good season considering how dry it was here in Tassie, I reckon I did the right thing by concentrating on the two rivers that have a regulated environmental flow on them all throughout the year. They were the Mersey & Meander Rivers. The ** Dasher river which is close to home always fishes well early season and a day after a dose of 20 mms or more later in the season. The fish weren't over large this season as the rivers are still recovering from the dry seasons and the influx of cormorants we had three years ago. But they are on the way back which is good..
Read more: The 2015-16 Trout Season Report - Adrian Webb. I have been fishing for as long as I can remember and my passion for this sport is still as strong today as it was way back then, when I was a young boy. I grew up in the rural township of Deloraine, with the Meander River flowing through its heart. Many hours were spent along the river banks with a tin of worms and infinite patience. Sometimes I would be rewarded for it, many times I wouldn’t, and upon reflection there were far too many times when I arrived home with an empty creel and nothing to show for my efforts. That being said, and ‘once again upon reflection’, with every trip I ventured out on, I think I learned a little more, soon my luck began to change ‘dramatically’ for the better. I had learned the “basics of fishing”. 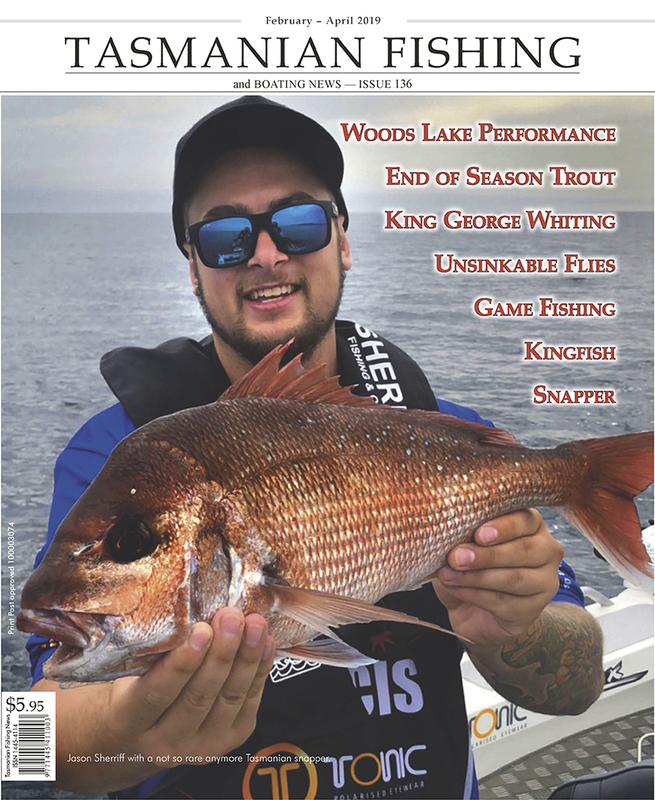 Todd Lambert offers this reflection on five of Tasmania’s more popular fisheries and how he as an ‘everyday angler’ felt they performed. Below is his season 2010/11 review. Even though most of our Lakes and rivers are about to close, there are still a few trout waters remaining open for those keen enough to venture out in a cold Tasmanian winter, but for the majority of us it’s time to sit back, turn our interests to other things and reflect back on the season past. 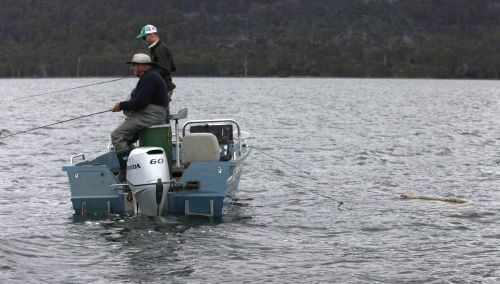 Many people ask me when the best time to come to Tasmania fishing is. There is only one answer as far as I am concerned – Autumn. March and April are what I call the wedding months. All the girls want to get married then. Why ? Because the weather is the most settled and they are almost guaranteed a beautiful day. I like it because the river fishing can be exception and I like river fishing. Grasshopers have been prolific the last couple of seasons with unprecedented grass growth no doubt helping the populations. 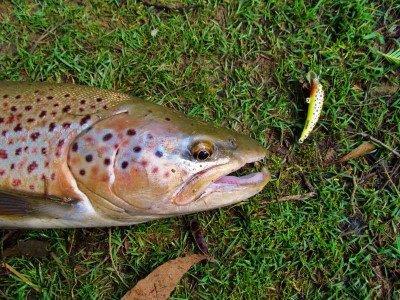 Grasshoppers obviously provide a ‘meal in a mouthful’ for river trout – they must be like a Big Mac for them and trout often swim meters to violently scoff one from the surface.